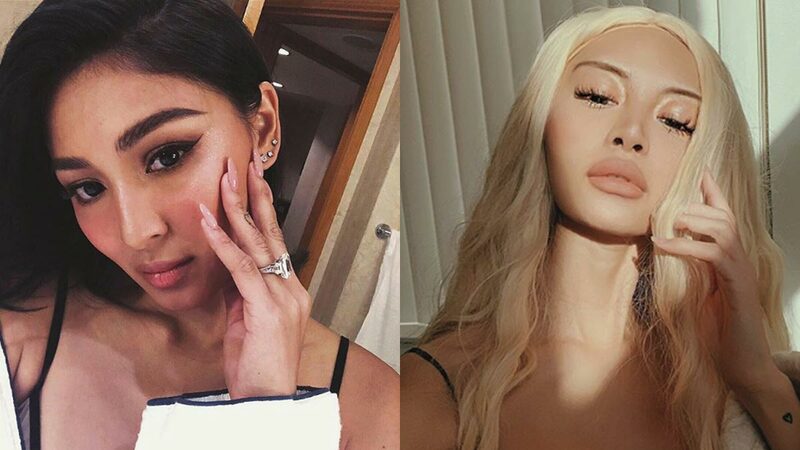 Ericka Villongco no regrets calling Nadine Lustre "copycat"
Ericka Villongco (right) does not regret calling Nadine Lustre (left) a copycat: "I remember thinking to myself 'wow, this girl can get any bag she wants, but she bought the same YSL I had?'" Ericka Villongco speaks out about the comparisons being made between her and Nadine Lustre's sense of style. "I'm sorry to say, I don't regret calling Nadine a copycat," the U.S.-based singer told PEP.ph (Philippine Entertainment Portal) via email interview early this week. "My fans were tagging me in multiple photos comparing the same top I wore months back, the same caption, her lip fillers and several other aesthetic resemblances. "I remember thinking to myself 'wow, this girl can get any bag she wants, but she bought the same YSL I had?'" YSL stands for Yves Saint Laurent, a brand that sells bags, among other luxury items. Ericka continued, "It just started to look like a trend of the many different things I was so proud to love. Ericka, former girlfriend of James Reid, and Nadine, the current girlfriend, made headlines last February 26 when the latter was accused of copying the Instagram posts of the former. Nadine reacted to the issue, saying that her style influences were often based on Hollywood celebrities. The Ulan actress said, "I think I have my own individuality naman so I don't see anything na parang... parang kokopyahin ko." Ericka does not follow Nadine on Instagram, but the two of them "have always been civil." She continued on the email interview, "I met her when she was shooting Diary ng Panget with James & I always thought she was a beautiful girl but I take pride in who I am & all the aesthetic life choices that go with my personality so when you have an art style so close to your soul, you know by heart when someone's just replicating it..."
Ericka said she did not want to "think ill" of Nadine at first, but the comparison between them eventually elicited unwanted comments. "In all honesty, I'm kinda flattered... but i'm only human and it started to bug me when these comments came along with hateful ones as well. "These people have called me many hurtful things over the years for merely being the ex-girlfriend of James and that is not fair. "It took me a while for to heal from those wounds & I can finally say that I'm out here living MY OWN truth & MY best life. "I welcome everyone to view my private life on social media but I want these fans to know that the person I show is only a mere percentage of the human being I am in real life."